NAB was chaotic, to say the least, with everyone trying to figure out how they were going to make a buck and keep someone else from taking their buck. Even Gary Shapiro, chief cheerleader for the CEA, got into the act by saying he really liked the NAB emphasis on 4K Ultra HD. He should because globally, TV sales are down and he has to figure that sharper, higher-quality content might encourage folks to replace their pretty new sets with a couple of newer sets. He said the first Ultra HD basketball game was a “buzzer-beater” and that was going to help drag people back in front of their TV sets. While the broadcasters are fighting the solutions that let you bypass the TV networks, they’ve also noticed that Nielsen says viewership has slipped from 69 percent 10 years ago to 42 percent today. That means it makes it tougher for broadcasters to maintain (raise) their ad rates. Companies spent $27 billion last year to show you their commercials and reached a smaller captive audience. Part of the problem is that the set producers have added more services, more capabilities to make it easier for you to get virtually anything on the big screen over the Internet (arguably better and free). In addition, people like Netflix, Amazon, Microsoft (always-on Xbox) make it really enticing to use their services rather than the cable guy (combined use of Netflix/Amazon is about $15 a month compared to $$$). Sony did their part to brighten things up by showing how great the broadcasters’ content was going to look on their screens. Getting it there would be another issue. Land of Make Believe – Sony was one of the few majors that had a big press unveiling but they seemed to have a typo in their key message to the industry. It probably could have been simply “Make Believe” because new players, new opportunities have changed the landscape … even for them. But at least the bosses were big enough to forgo their annual bonuses! Of course, Broadcasters took note of the fact that people are really watching more video on all the other screens they have – computer, tablet, smartphone. People are quickly adopting the idea of viewing anytime, anywhere. Choices – People like choices (even when they’re confusing); but they’re increasingly finding that big cable/satellite bills that constantly go up aren’t one of them–especially when set manufacturers are making it easier to access Internet-based content. So broadcasters are scrambling as fast as they can to get onto the popularity wave in every way possible. All of the networks and stations have their own apps that let you download/view their content either as it’s being aired or delayed (hey, if you’re timeshifting already, do you really care?). That’s great news for the wireless folks because you’re paying for minutes and content racks up a lot of minutes. It’s bad news for broadcasters/stations because they have previously charged advertisers based on big Nielsen household numbers. Being a real wet blanket at the party, BTIG media analyst said, "It's like the music business. They decline and decline and one day the bottom falls out." It’s not really that bad because the broadcast industry has recognized the world has changed and they have to change with it … or else. The good news/bad news is that Nielsen has added mobile viewership to their reporting. The problem is the number of devices reported is a whole lot lower per show (and a lot more exact). To keep their content away from the free-over-the-iNet folks, a number of the networks have made acquisitions and invested in pay outlets which gives them the opportunity to take their content out of the equation. Since the majority of the stuff in the digital universe is entertainment and social media, it’s only logical that the entertainment industry would try to figure out how to leverage social media on the viewers’ devices. Touching You Softly – Since people regularly have their tablet and smartphone with them – and use them even when watching old-fashioned TV, content developers/distributors are getting creative to get you involved with and sharing information about their content. It’s a good work-in-progress. They want to control the messages, self-police inappropriate messages and mesh the content with the new viewing formats. They’re working hard trying to figure out how to leverage the use of the 2nd screen and make the first screen content more appealing. The key is finding the right audience and maximizing the impact of the content with the viewers. Since it is much more focused than a shotgun approach, it is a bumpy road their traveling. A number of tools were introduced at the show that would allow journalists, announcers, producers to analyze the audience virtually in realtime and send invitations, ideas, messages to 2nd/3rd screens. The broadcasters are also working on building interactive scenes for the virtual viewers to integrate them into the action. The idea (hope) is to involve the viewer and pull him/her/them into the content by giving them more input and control over the content. The traditional entertainment producers and content providers are becoming more comfortable as things progress with the new media distribution platforms. They have all taken notice of the subscription video on demand (SVOD) services and the success they have gained in recent years. 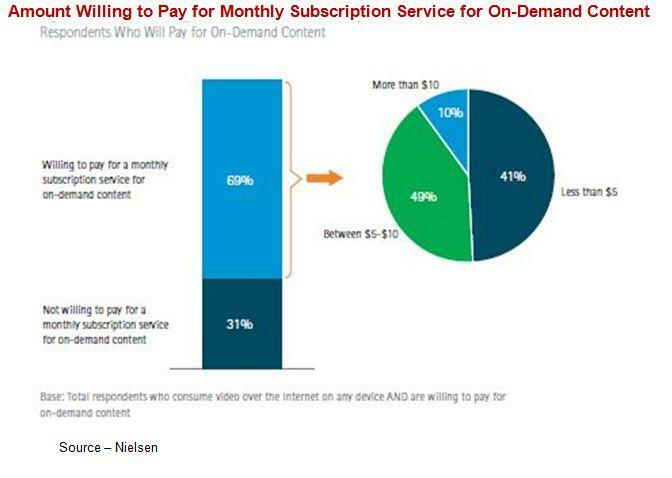 On-Demand Content – While people prefer free content (who wouldn’t? ), research shows that people are willing to pay for the content they want when and where they want it. At the same time, 90 percent of the content providers are looking at and moving to paywall options as a means of recovering/increasing their incomes. Broadcaster and consumer acceptance is accelerating as broadcasters are more willing to offer and consumers are more willing to pay a reasonable fee. To make the dual (or tri) pronged approach the majority of the broadcasters/content producers/owners are looking very hard at making their content available online and behind paywalls, cutting out the free iNet services. At the same time using other online services like YouTube to promote and build their online customer base. The online entertainment arena is moving in the same direction as the news/sports firms. More than 90 percent of these organizations already have or are in the process of implementing premium paywalls. Over the next two years most should have their infrastructure and programs in place for the entertainment consuming public. When it is completed the “free for all” online culture of the Internet using community will have to change or be left to find/watch indie or personal stuff on YouTube. But just remember even Google (YouTube’s parent) is a for-profit organization. The key is getting the pricing right for them and the consumer. 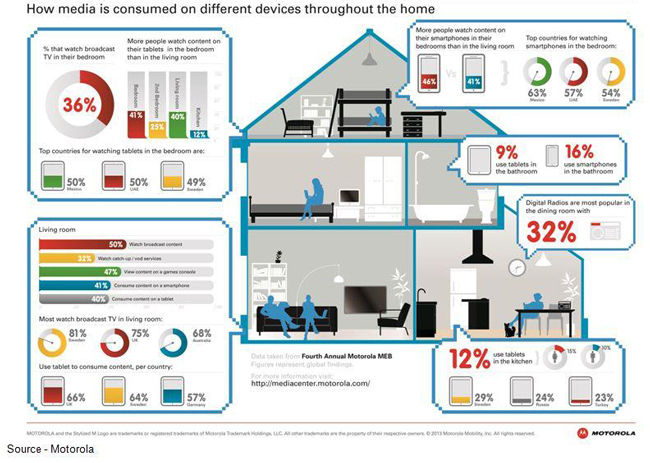 Still at Home – While people are increasingly using their smartphones and tablets to watch video content, most of the viewing is still done at home, somewhere. The challenge for everyone in the broadcast industry is to figure out what you want, when you want it, where you want it and to get you to pay for the content. It’s not easy to make everyone – including stockholders – happy. Unlike the government, the entertainment industry really doesn’t want to, nor can it afford, to leave any man, woman or child behind.